Let’s start with no fail way to hard boil eggs. I know there are a ton of different methods that everyone swears by, but this has never failed! Place your eggs in the bottom of a saucepan. Fill up with cold water and stop when the water level is about an inch above the eggs. Once the water starts to boil, set your timer for 8 minutes. Bring the eggs to the sink and fill the saucepan with ice water. The ice bath will stop the cooking process. Once cooled, crack all the eggs and carefully take the yolk out and placed the yolks in a separate bowl. You can either dye them with natural food coloring or use beet juice. I used natural food coloring this time, cause I wanted to achieve a light pink color for Easter. One or two drops of food coloring in the water. Place the half eggs in the water bowl, and let the color start to set in. This process will only take a minute or two. Be sure to keep an eye on them so you can obtain the look you want! Once it’s the perfect pink, take them out and place on a paper towel to dry. Let’s get our truffle on! Combine yolks with the next six ingredients. Mix until thoroughly incorporated and creamy. Season to taste with salt if needed. Pipe or scoop mixture into your pink egg whites. Top with either a sprinkling of black salt or another finishing salt. Let’s get pretty, shall we! 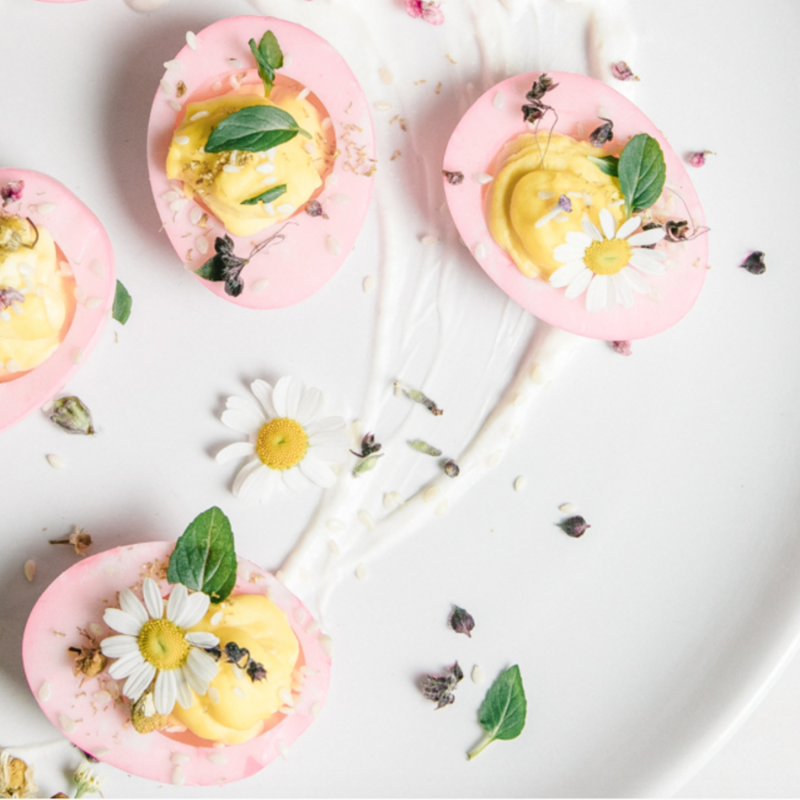 Chamomile is in all the stores now, and they made the perfect finishing touch to the eggs! I also did a dollop of creme fraiche on the plate to give that extra fun presentation. A sprinkle of edible lavender and black sea salt completes the dish!